Happy Friday, you guys! This was my first *full* week in Lima (I arrived on Tuesday 9/4 and last week, we were in Cusco Wednesday-Sunday) and it’s felt so nice to get settled in a little bit. This week absolutely flew by, though. 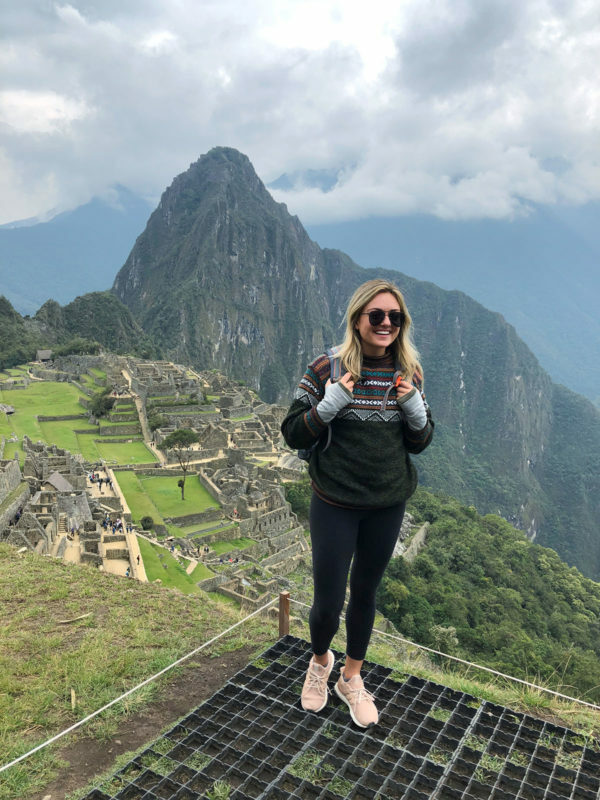 I can’t really believe how much I’ve done in the last three-ish weeks that I’ve been here… Seeing Machu Picchu was definitely a highlight! And can’t believe I move to Colombia next weekend! Time feels like it’s moving faster than ever and I’m trying to savor every second of this wild ride. If you need a re-stock on any of your favorite beauty products, now’s the time to do it! Bluemercury has an amazing swag bag promotion going on right now… Just use code HAPPY19 for orders of $150+ to get the goods. (You can see the products here!) I’ve found so many new products to love when Bluemercury has done similar things in the past… And the products are always great to toss in your travel toiletry bag, too! This weekend is the last weekend for Nordstrom Triple Points, ends on Sunday! Love love love seeing Melissa’s photos from our trip to Florence in July! The new Bob Moses album is soooooo good. Obsessed with this sweater! The color is perfection, I love the oversized shape, and the price is right. I finally got my hands on a pair of Yeezys!! I ordered them here. I think decor is even more tempting for me now that I don’t have an apartment. I longingly browsed the new arrivals at Serena & Lily for way longer than I should have this week! How gorg is this bar cart?! I’m loving this media cabinet! Can’t speak to the quality, but it’s an amazing price. So fascinated by Liz’s Faster Way to Fat Loss post, she looks amazing! Absolutely adore the color of this sweater! I got a chennile sweater last winter and it’s the coziest thing ever. I have a few new books to pick up after seeing what Mackenzie read this summer! You may think I’m crazy, but A&F’s coat game is real friggen strong right now! I’m going to *need* this teddy coat, in both the dark brown and the pink. (It’s only $120, too!) I think this puffer is so chic in every color — classic black, crisp white, olive green, and dusty rose. (Reminds me of the Veronica Beard one I have for *way* less!) I’m obsessed with the exaggerated collar on this cropped puffer, love the green and camel colors in this classic wool coat, this grey wool coat looks much more expensive than it is, and this sherpa half-zip is all sorts of cozy. This one might be my favorite though — how chic is this denim jacket with the attached pink hoodie? I die. Umm… You can now buy (or aggressively window browse) Cartier online at Selfridges!! If you need me, you know where to find me. OMG, that pic is beautiful. You are living the life. I’m totally envious. Im so happy i finally found your blog back! Peru sounds amazing…i hope to visit it too someday! A children’s book for adults sounds so interesting! Your Friday Finds are my fave! Thanks for sharing the updated instagrams! Following on both! You look so happy and it is easy to see you took the right decision!